Més informació "A new genetic test improves and expands the detection of mutations that cause resistance to colon cancer treatments"
The Hospital del Mar Medical Research Institute and the Vall d'Hebron Research Institute, in collaboration with the MútuaTerrassa Foundation, were the only Spanish research centres to participate in the largest study to date into genome association with ischaemic stroke, and which involved around 38,000 patients and 400,000 control subjects. The study, published recently in Lancet Neurology by two international consortia, has led to the identification of a gene implicated in atherothrombotic ischaemic stroke. The team of Dr. Jordi Jiménez-Conde, head of the Genetics Area within the Neurovascular Research Group at the IMIM and a neurologist at the Hospital del Mar, took part in the discovery phase of the study. This first part involved the analysis of nearly 900 samples from stroke patients and 1200 controls from the Hospital del Mar, this being the second-ranked centre internationally according number of cases. Més informació "Hospital del Mar and Vall d'Hebron take part in the biggest international genomic study into strokes"
A study published in the prestigious journal Scientific Reports from the Nature group demonstrates, for the first time and using computational tools, that polyunsaturated lipids can alter the binding rate of two types of receivers involved in certain nervous system diseases. The work was led by members of the Research Programme on Biomedical Informatics at the IMIM (Hospital del Mar Medical Research Institute) and Pompeu Fabra University as well as researchers from the University of Tampere (Finland), and also involved scientists from the University of Barcelona. 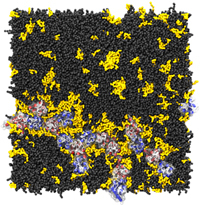 Using latest-generation molecular simulations, which are like “computational microscopes”, the researchers have demonstrated that a decrease in polyunsaturated lipids in neuronal membranes, as seen in Parkinson's and Alzheimer's sufferers, directly affects the binding rate of dopamine and adenosine receptors. Més informació "Regulating neuronal membrane lipids could be the key to Alzheimer's and Parkinson's"
People with anxiety disorders have an increased risk of suffering chronic diseases such as heart disease, chronic pain, and peptic ulcers. This is one of the conclusions of a new study published in JAMA Psychiatry, led by the University of Otago (New Zealand) and involving Dr Jordi Alonso, director of the Epidemiology and Public Health programme at the Hospital del Mar Medical Research Institute (IMIM) and a CIBERESP researcher. The study found that all kinds of mental health disorders, related to mood, anxiety, and impulse control, as well as substance use disorders, are associated with an increased risk of a wide range of chronic physical diseases. The researchers studied the relationship between mental disorders and ten diseases: arthritis, chronic pain, heart disease, stroke, hypertension, diabetes, asthma, chronic lung disease, peptic ulcers, and cancer. Més informació "People with mental disorders have an increased risk of developing chronic physical diseases"
Researchers from the Hospital del Mar Medical Research Institute (IMIM) have found an epigenetic mechanism implicated in the regulation of blood sugar. The study, published in the journal Molecular Human Genetics, reveals that the methylation of the TXNIP gene is associated with diabetes mellitus type 2 and, in particular, average blood glucose levels. These results, replicated in two patient cohorts, could help to both identify patients at risk of developing diabetes and control treatment response, as well as generating possible future therapies for this disease, one of the major cardiovascular risk factors in the population. The work was coordinated by Carolina Soriano, from the Neurovascular research group at the IMIM, and Jordi Jiménez Conde, from the same group and a neurologist at the Hospital del Mar, in collaboration with the IMIM's Cardiovascular Epidemiology and Genetics group. Més informació "New type 2 diabetes biomarker identified"
According to an epidemiological study carried out by researchers at the Hospital del Mar Medical Research Institute (IMIM), increasing the money you spend on food is linked to a better quality diet, particularly increased consumption of fruit and vegetables, leading to a healthier weight and decreased risk of cardiometabolic diseases like obesity, diabetes, and cardiovascular problems. The researchers monitored a group of 2181 Spanish men and women aged 25 to 74, all part of the REGICOR (Registre Gironí del Cor) programme, for a period of ten years. They measured their height and weight, and recorded dietary data obtained from a scientifically validated food frequency questionnaire. The average food cost was calculated using official government data. Més informació "Spending more on food is associated with a healthier diet and weight"
Researchers from the Hospital del Mar Medical Research Institute (IMIM) in collaboration with scientists from Pompeu Fabra University, the Pasteur Institute andPierre and Marie Curie University, have discovered a crucial neural mechanism that explains the process of nicotine reward and addiction. Nicotine, the principal psychoactive component of tobacco, is quickly absorbed through the nasal, oral and respiratory membranes and takes 7 seconds to reach the brain where the receptors are located. It is there where it acts on the central nervous system as well as the autonomic nervous system. This almost immediate relationship between the inhalation of the smoke and its effect at a cerebral level is one of the factors contributing to the highly addictive nature of nicotine. This is explained by the fact that the nicotine exerts its psychopharmacological effects by activating receptors that are very abundant in several specific regions of the brain, the nicotinic acetylcholine receptors (nAChR). Més informació "A novel brain mechanism for nicotine addiction"
Research just published in the journal Plos Genetics has found that gaining new genes during evolution is a much more frequent event than previously thought. It has been seen that there are hundreds of genes that might be unique to humans, and something similar occurs in chimpanzees. Some of these genes will be useful for the organism in question and the rest will disappear in time. The work was led by Mar Albà, an ICREA researcher at the Mar Institute of Medical Research (IMIM) and Jorge Ruiz-Orera, from the same group, together with researchers from Pompeu Fabra University (UPF) and the Centre for Genomic Regulation (CRG). For some time it was thought that all new genes originated from other genes, for example, from duplications of already existing genes. But recently it has been seen that some, the so-called de novo genes, originate in genomic regions that previously contained none. According to Mar Albà “This work shows that the formation of DNA motifs, through the accumulation of random mutations, would have been a determining factor in the emergence of new genes.” DNA motifs are elements that activate gene expression. Més informació "New genes formed continuously allowing acquisition of novel functions during evolution"
A study by the Cardiology Service's Heart Failure Unit at the Hospital del Mar and IMIM (Hospital del Mar Medical Research Institute) has demonstrated that patients with chronic heart failure (HF) who are telephonically monitored have better results with regard to relapse and rehospitalisation than patients that receive conventional on-site follow-up. For six months the researchers used an electronic platform to analyse the evolution of a group of telephonically monitored patients, who used videoconferencing to communicate with the healthcare team. According to the study published in the Journal of Telemedicine and Telecare, the group being monitored using telemedicine also involved a 3,546 euro reduction in average cost per patient compared to the control group, over the six months of follow-up. Més informació "Using telemedicine to treat heart failure reduces clinical complications and decreases the cost by over 3500 euros per patient"
A new integrated computational method helps predicting adverse drug reaction—which are often lethal—more reliably than with traditional computing methods. This improved ability to foresee the possible adverse effects of drugs may entail saving many lives in the future. The study that is being conducted by researchers from IMIM (Hospital del Mar Medical Research Institute), Pompeu Fabra University, and the company Chemotargets, within the framework of the European eTOX project, was chosen for the cover of the journalChemical Research in Toxicology. Most computer tools employed today to detect possible adverse effects of compounds that are candidates for new medicines are based on detecting labile fragments in the drug's structure. These fragments can potentially transform to form reactive metabolites, which can have toxic properties. This is what is known as idiosyncratic toxicity and is a big headache for the pharmaceutical industry, as it tends to be detected in late development stages of the drug and even when it is already on the market, often causing the drug to be withdrawn. Més informació "New computational approach to predicting adverse drug reactions with higher confidence"